Here's one of the true treasures of my office collection, a Star Trek "walkie-talkie" communicator, copyright 1974 (with belt clip!) 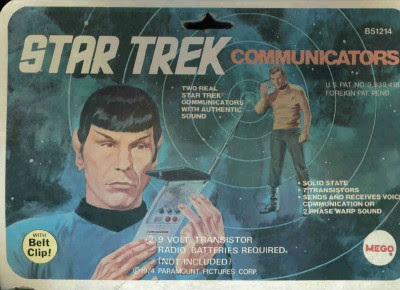 Direct from Mego, this toy features two "real" Star Trek communicators "with authentic sound." In terms of fidelity to the original prop seen on the show, this toy communicator doesn't rate particularly high. 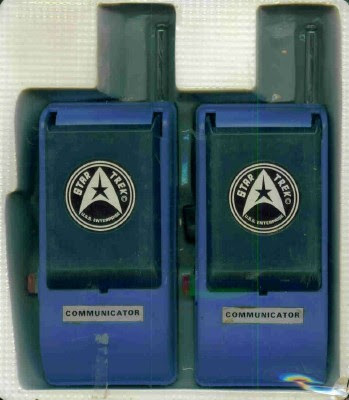 This communicator is blue, larger than the device seen on Star Trek, and the flip-up grille is emblazoned with an Enterprise logo that wasn't on the communicator on TV. Still, who's to complain? This toy rocks. I can remember spending literally DAYS playing with these walkie-talkies communicating back and forth on a "landing party" on the wooded trails near my house in New Jersey. What fun! Anyway, to punctuate this blast from the past, here's a YouTube clip, a commercial for this very toy. God bless the person who posted this. Note how serious the kids are in this commercial! That was me as a youngster too!